Listener161118: one of the songs is "Ancient of Days". Am I right? HopeFM-Radio: Sure. Thanks for listening to the request show on Hope FM. HopeFM-Radio: Thank you! Stay tuned for the Sunday show after the news. Listener161151: Oh yes indeed! I am certainly awaiting with my children...from Bulwell. HopeFM-Radio: Sure. PLaying now. Thank you for listening to the Sunday show. Listener161149: Let my life by Bright ones. I heard it last night. Listener161154: I’ve learnt much in your show today. Thanks. HopeFM-Radio: @Listener161149: Thank you for your request. HopeFM-Radio: @Listener161154: Thank you. If you have any questions. you can text us on 01158 24 54 64 or on this chat. Thank for listening. Listener161157: Great show Gabriela. Can you play circles. HopeFM-Radio: Thank you for all your requests and comments. 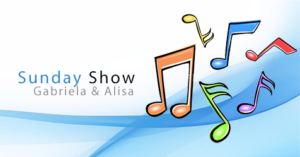 You can tune in again between 11am - 12pm for the Request show, and the Sunday Show 12pm - 1pm.